How many mornings do you wake up and think to yourself, “I have nothing to wear?” While you may have a closet filled with clothes, sometimes styling an outfit is easier said than done. If you’ve fallen into a rut of wearing the same basic uniform, day in and day out, then that’s all about to change. Enter the colored blazer. While we are all aware of the colored jeans trend (been there, done that! 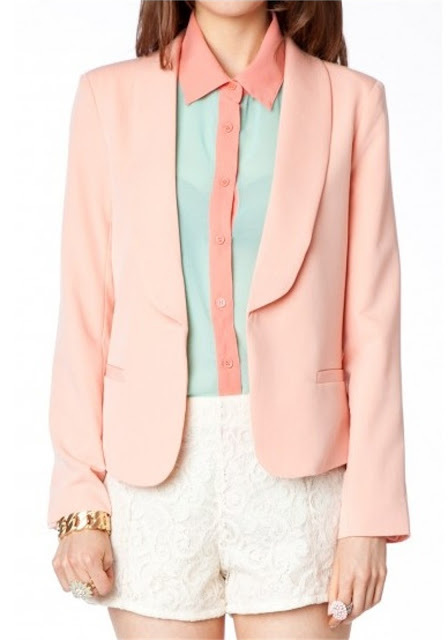 ), what about a blazer in a bubblegum pink or neon-tastic hue? For those of you running out of daily outfit inspirations, here’s a quick tip: throw on a colored blazer. Whether you’re wearing an outfit full of neutral colors or one consisting of prints, a colorful blazer can only enhance your look. You know that simple navy blue dress that you’ve worn a million times? Well, with the help of a green blazer, it’s not so boring anymore! In fact, colored blazers are so popular that they’re showing up everywhere these days.From being spotted on the catwalk and stylish celebs to fashion bloggers like Emily Schuman (Cupcakes and Cashmere), this is one jacket that you won’t want to miss! Blazers in coral, orange and pink hues consistently appeared in spring 2012 runway shows (from left to right: Jill Stuart, Chloé, Tibi). Based on the looks above, one of the easiest ways to style your colored blazer is with shorts. While a shorts and blazer combo may not exactly be work-appropriate, it will help you to achieve that no-nonsense, laid-back and cool look that you so desire. The first time that I saw this ensemble on Cupcakes and Cashmere, I thought that it was so effortless, casual and perfect for the end of summer. While blazers often tend to be associated with fall and winter, that couldn’t be further from the truth. Blazers in vibrant colors such as green, pink and yellow might as well be reserved for fun-in-the-sun days! To say that I can’t get enough of Emily’s outfit would be an understatement. From her lightweight chambray shirt and green blazer (with matching striped shorts, might I add!) to her to-die-for Mulberry bag, she nails this look. I love Jessica Alba’s style solely based on the fact that she loves color (and has Brad Goreski as her stylist)! Whether she’s wearing violet colored jeans or a pink blazer on top of a black polka dot blouse, she always has fun with her style. The look above is no exception. Take style cues from her by selecting a skirt or a pair of pants in a shade that complements the color of your blazer. Her watermelon-colored jacket and sky blue pants are an excellent match and does exactly that; they’re bright, but not overwhelming in the least. To downplay her color-infused ensemble, Jessica sticks with a lovely white blouse and scarf. If you’re searching for a blazer in a rich and saturated hue, then look no further. A green blazer will be sure to add a fun twist to any ensemble because it is both conventional and wearable. Play up your feminine style by pairing it with a sweet lace dress or go bold by wearing it with pastel pink jeans. With this punchy hue, the sky’s the limit! Do you want to make a statement, but prefer to do so subtly? 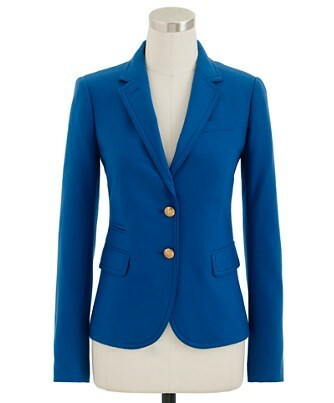 For a look reminiscent of Jill Stuart’s spring 2012 runway collection, here’s the perfect blazer to get you started. Dress it up or down, and this lovely peach blazer will maximize your wardrobe options. Wear it as styled above, with a flirty blouse, white lace shorts and some gold jewelry for a girls night out. Or, keep it casual by pairing it with your favorite jeans, a t-shirt and ballet flats. Make this classic schoolboy blazer from J. Crew a priority on your back-to-school shopping list! Coming in a beautiful shade of cobalt blue, it is exactly what you need to add some panache to your daily look. Pair it with everything from a scarf and jeans to a chic LBD. Did I mention that it’s made of wool flannel – just in time for the fall season! There’s no time like the present to test-drive a new trend and step out of your comfort zone. While blazers in an array of colors may seem intimidating at first, it doesn’t have to be that way. Invest in one colorful blazer, and see how many outfits you can come up with!